Trembling aspens are a delight to ride through; the leaves make a soft rustle. The Nature Conservancy’s Pine Butte Ranch in Montana is nestled into the Rocky Mountain Front – the vast plains and prairies stop at the lodges’ front door, and the back door path leads to mountains covered with pines, firs and Populus tremuloides, better known as Trembling or Quaking Aspen. 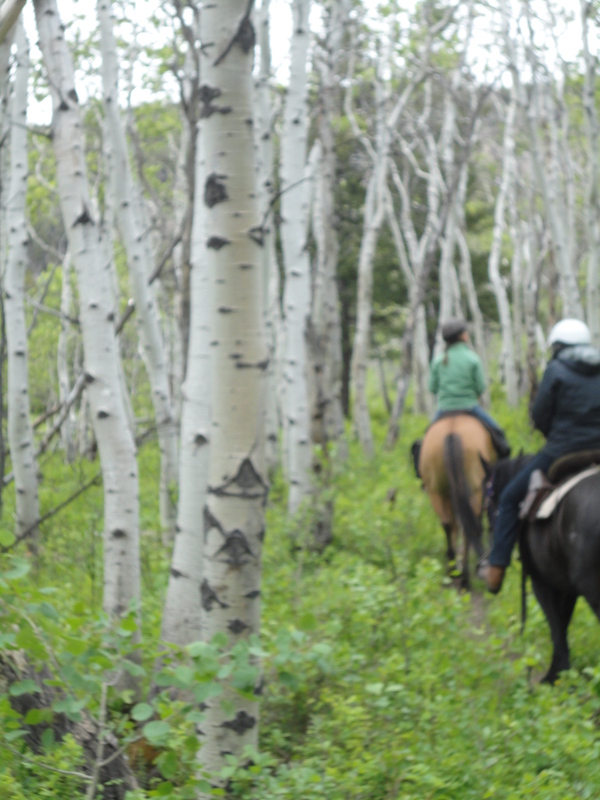 I was fortunate enough to spend last week horse riding among their aspen groves and learning from ranch naturalists. The leaves are firm, but very thin and flutter in the wind. I thought they were so well adapted to Montana’s windy, cold weather that calling them “quaking” or “trembling” was a misnomer. Those aspens aren’t afraid of anything! Aspens are the first trees colonizing after a fire or logging by sending up suckers from extensive shallow root systems, with stands of trees called ‘clones’ since all are connected underground and are genetically identical. This is observed in early spring when an entire grove suddenly leafs out at the same time. In the fall, we in Virginia are used to seeing each individual trees color up over a matter a weeks. There, all of the trees on the right side of their aspen grove turn vibrant yellow overnight. The Pine Butte naturalist tells me that three days later, all of the trees on the left side turn a slightly different shade of yellow. Thus they have only two clone trees near the pasture although they have several thousand trunks that cover several acres. The trees on the right turn yellow first each fall; the clone on the left is later. Aspens are well adapted to the north because their greenish bark is phosynthetic allowing them to achieve photosynthesis before their leaves come out in the spring. The trunk can produce a white powdery material for protection from ultraviolet radiation, which natives are said to have used for sunblock! Bears also seem to use aspen trees as emery boards to sharpen their nails. I was closely examining one of the tall aspens, when the naturalist ordered us all to quickly move on. She had spotted a black bear cub peering at us from high above, meaning mama bear was probably nearby and nervous of our presence. An artists delight: the greenish-white bark is marked with rough black spots and branch collars. Although I fell in love with the Trembling Aspen’s grace and character, it wouldn’t thrive in our Northern Virginia heat and heavy clay soil and its suckering qualities wouldn’t make a good street tree! It is best left to the mountains and the bears. This entry was posted in Education and tagged aspen, favorite tree, vacationing. Bookmark the permalink. Excellent article, Nora! 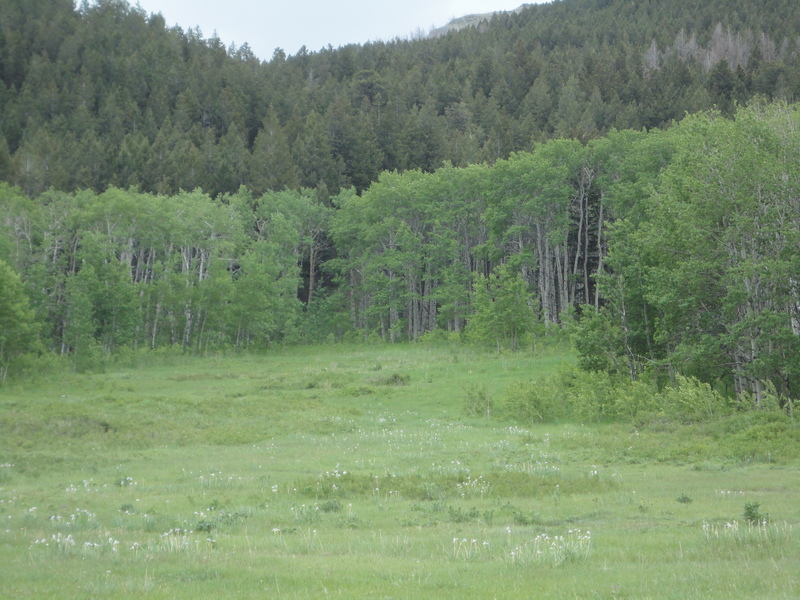 Lucy and I were shown a whole mountainside of aspens in color near Albuquerque, all the same size and same age: clones that sprang up after a forest fire. We were told (but I have not verified) that that aspen forest, or one somewhere, all connected underground, was the largest single living organism in the world, by tonnage. Does anybody else know that story, and if so, if it’s true?? Charles Spencer, T.S.